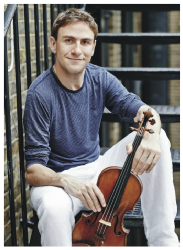 Young Polish violinist Bartosz Woroch is an exceptional artist, whose recent disc of solo violin repertoire, Dancer on a Tightrope, was greeted with deservedly five star reviews. With pianist Caroline Palmer he presents a programme contrasting the mature classical Fantasy of Schubert with another late essay by Francis Poulenc, written towards the end of the Second World War. In a further exploration of music from Eastern Europe the programme is completed with Szymanowski's evocative Myths composed during the First World War. This will be a compelling concert in the intimate setting of Luton’s most atmospheric music venue, The Bear Club.